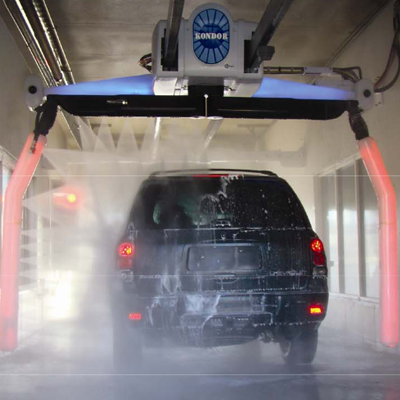 The new Belanger Kondor® touchless automatics deliver an updated wash experience, for new and existing bays alike. The KL1 (1-Arm) offers the smoothest one-arm operation ever, while the KL2 (2-Arm) further increases navigational certainty and allows simultaneous chemical application and rinsing. Innovations include a less intrusive, compact carriage head, and installation options for almost every bay size. What’s more, every Kondor® is built to impress. The narrow overhead rails form an ‘inverted runway’ that helps drivers get in position. The compact carriage head helps users feel safer, and eases diagnostic and service procedures from just two ladder positions. The Auto-Resetting Breakaway Arms reset themselves in all four directions. A stainless steel carriage frame is available based on operator preference. The Kondor® is designed to clean, and built to keep cleaning. So every Kondor® includes essential solution delivery injectors – including two presoaks and a wax application. Other application options include Triple Foam, Spot-Free Rinse, additional waxes, and bug spray. The galvanized travel rails and proven 25HP motor with CAT 35/35 Pump help ensure an extended service life and ROI. Increase appeal with branding options and functional lighting. Available white carriage housings and colored branding panels with custom logos are perfect for site branding. Optional ‘Active Site Marketing’ Wing Covers cycle through 6 backlit colors to attract customers off the street and onto your site. And the available LED Navigation System illuminates the wash arms with RGB color changing lights to help drivers quickly position their vehicles. Less intrusive design helps drivers feel safer, and eases diagnostic and service procedures from just two ladder positions. Delivers maximum flexibility when ‘reloading’ existing bays, while providing more options for new construction projects, as well. Form an ‘inverted runway’ that helps drivers easily position their vehicles. Includes two presoaks for extra cleaning power, and a wax application for improved drying or clear coat sealant applications. Offer the strength of steel, with the cost-effective corrosion resistance of a rugged galvanized coating. Proven industry ‘workhorse’ helps ensure an extended service life and ROI.